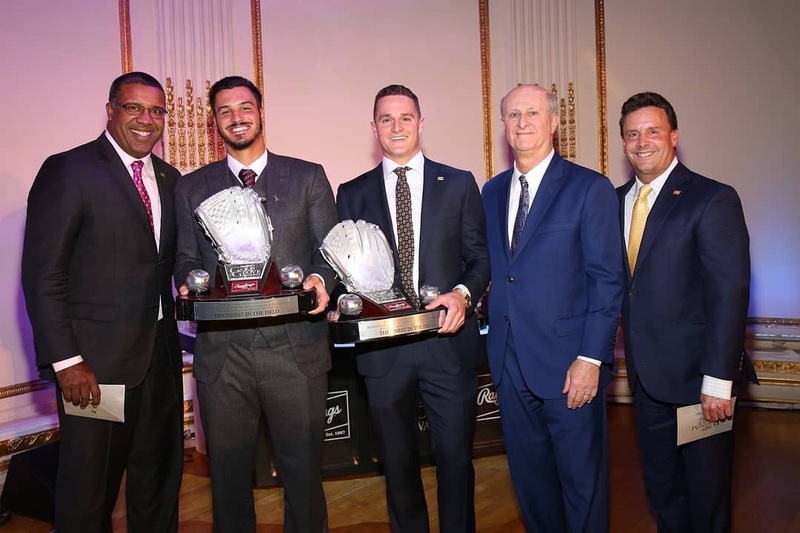 NEW YORK - November 9, 2018 — Rawlings Sporting Goods Company, Inc., announced that Colorado Rockies™ third baseman Nolan Arenado and Oakland Athletics™ third baseman Matt Chapman won the 2018 Rawlings Platinum Glove Award™ presented by the Society for American Baseball Research (SABR) in their respective Leagues. The winners were unveiled tonight during the 2018 Rawlings Gold Glove Award® Ceremony, where the game's top defensive stars accepted their hardware from some of baseball's greatest defenders. This is the second Rawlings Platinum Glove Award for Arenado and the first for Chapman. Arenado, the six-time Rawlings Gold Glove Award winner, is the only Colorado Rockies player to win a Rawlings Platinum Glove Award. He is the first infielder to start his career with six consecutive Rawlings Gold Glove Awards. Chapman is the first Oakland Athletics player to win the Rawlings Platinum Glove Award. He led all of Major League Baseball® with 29 defensive runs saved. 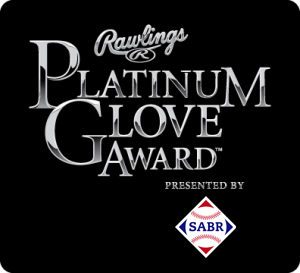 "Now in its eighth year, the Rawlings Platinum Glove Award fan inclusion platform continues to prove that baseball fans know, value and celebrate defensive greatness," said Mike Thompson, Chief Marketing Officer for Rawlings. "This year's fan vote greatly exceeded our expectations; with passionate fans from countries across the globe letting us know who they believe to be the best defenders in baseball." Based on the final SABR Defensive Index, Chapman led the American League with a 21.9 SDI, and Arenado finished with a 6.8 SDI, which led all third baseman in the National League. Voting began at the conclusion of the 2018 Rawlings Gold Glove Award Announcement Show that aired on ESPN's "Baseball Tonight" on November 4, 2018, and ended on November 8. Fan discussion surrounding the Award on social media was fostered in part by some team's open campaigning for their respective nominees. ESPN's Karl Ravech and Eduardo Perez and SABR's Gennaro announced the winners live on stage during the show. Colorado Rockies™ third baseman Nolan Arenado and Minnesota Twins™ center fielder Byron Buxton won the 2017 Rawlings Platinum Glove Award. The Rawlings Gold Glove Award® is a registered trademark owned by Rawlings Sporting Goods Company, Inc. The award is correctly identified as the Rawlings Gold Glove Award. The name should not be shortened, abbreviated or otherwise misused. Proper identification of this service mark using the registration symbol and the Rawlings name is important to protect the integrity of the program and perpetuate this worthy tradition. For more information, please visit www.rawlings.com. The Society for American Baseball Research (SABR) is a non-profit organization dedicated to fostering research and disseminating the history and record of baseball. Founded in 1971, SABR has more than 6,000 members worldwide and has established itself as a vibrant baseball community and a premier distributor of ground-breaking baseball information. SABR features 70 chapters and 30 research committees, and produces three annual publications — two editions of The Baseball Research Journal and The National Pastime — in addition to other print and e-books. SABR also hosts annual events, including the National Convention each summer, and the SABR Analytics Conference in March in Phoenix. For more information about SABR, go to SABR.org. This page was last updated November 9, 2018 at 10:22 pm MST.